Oludamini Ogunnaike is an assistant professor of Religious Studies at the College of William and Mary. He teaches courses on Islam, Islamic Philosophy, Spirituality, and Art, as well as African and African Diasporic Religions. He holds a PhD in African Studies and the Study of Religion from Harvard University, and spent a year as a postdoctoral fellow at Stanford University's Abbasi Program in Islamic Studies. Professor Ogunnaike's research examines the philosophical dimensions of postcolonial, colonial, and pre-colonial Islamic and indigenous religious traditions of West and North Africa, especially Sufism and Ifa. 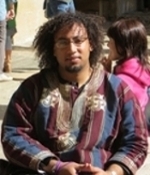 He is currently working on a book entitled, Sufism and Ifa: Ways of Knowing in Two West African Intellectual Traditions and maintains a digital archive of West African Sufi poetry.